Hatnua chairwoman unfazed by polls predicting her party won't pass electoral threshold. 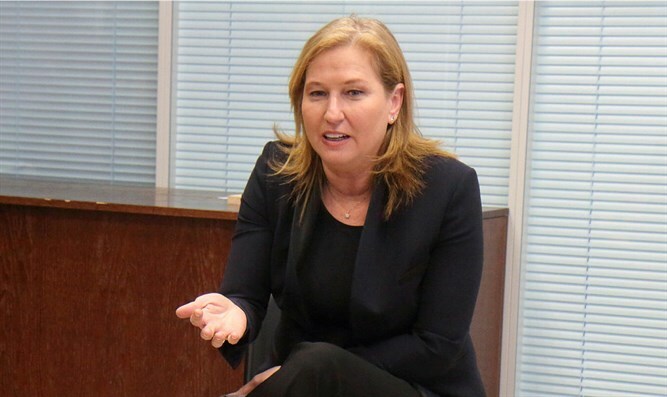 Despite the fact that the polls show that her party will not pass the electoral threshold in the April election, Hatnua chairwoman MK Tzipi Livni clarified on Sunday evening that she is not quitting and intends to run to the end. "I am running as the head of Hatnua and I joined the Zionist Union in order to create the dynamic of a bloc. Twice I had the opportunity to head a party and in both cases we gave Netanyahu a strong fight. The public will decide whether I will be with Lapid or Gantz after the elections. I am running as head of Hatnua,” Livni said in an interview with Radio Kol Chai. Asked about the conduct of Attorney General Avichai Mandelblit in connection with the investigations against Netanyahu, Livni replied, "I trust Avichai Mandelblit, even though at the time I thought it was wrong that Netanyahu's government secretary would become the Attorney General. I refused to demonstrate outside the Attorney General’s home because I trust him. If Mandelblit decides to postpone making his decision public, it would be political." "The demonstrations near Mandelblit did not affect him. He is a decent and honest man. He has no interest in making a political move. He is in a situation where he has to make a decision. We must trust the police, the Attorney General and the courts." Livni attacked Prime Minister Netanyahu and claimed that his conduct sends the message that he believes he is above the law. "The prime minister says he has no faith in the police because they are framing him, then he will say that the left defeated him and will later accuse the courts - no one is above the law. The Likud headed by Begin had great respect for the legal system." "Every one of us who fears for democracy cannot give Netanyahu a ticket to the premiership and let him do what he wants." Asked about Labor's collapse in the polls, Livni said she was not gloating. "After the ugly divorce, I have no joy but frustration. I told Avi Gabbay that we have a full partnership. He decided that the Labor Party headed by him would win 30 seats. I warned him several times. He told me that he did not believe in the Zionist Union. I do not want to tell them 'I told you so.'"